When, on publication of Rooney’s 2017 debut Conversations with Friends, her editor compared the young Irish novelist to JD Salinger, I’m not sure this is what she had in mind. It was only after that book came out that Rooney first felt comfortable describing herself as a writer, though in truth, she had been scribbling away on and off since, as a 15-year-old, she began attending a writing workshop every second Monday in the small market town of Castlebar, Co Mayo, where her mother ran the local arts centre and her father worked for Irish Telecom. In 2015, shortly after embarking on a Master’s in American literature at Trinity College Dublin, where she had read English as an undergraduate, Rooney, then 24-years-old, sat down at her laptop and — in three breakneck months, writing for 10 hours a day until her eyesight went fuzzy and her head began to spin — completed “a really rough, unreadable first draft”, 100,000 words long, of what would eventually become Conversations with Friends. In the months that followed, Rooney would occasionally return to the manuscript, but mostly it lay semi-abandoned, somewhere between her bottom drawer and the back of her mind. Towards the end of that year, just as she was completing her post-grad degree, the idea for another story took up residence in Rooney’s brain. It would be, as she puts it now, “about people of the same age, in the same city, in the same college, looking at the same issues at pretty much exactly the same moment in history” as Conversations with Friends and, like the earlier tale, would be a love story of sorts, an attempt to “deal with romantic intimacy on a granular, almost forensic level”. Normal People, by Sally Rooney. At first, she wrote it as a short story (later published in the October 2016 issue of The White Review as ‘At the Clinic’), but something about the broadly symbiotic, intermittently sexual relationship between its two main characters, Marianne and Connell, demanded a larger canvas. So Rooney decided that she was “just going to bin Conversations with Friends; at that point, nobody else had read a word of it” and instead plunge headlong into a Marianne and Connell novel, one that would track its faltering young duo episodically, from the end of their school days in small-town west Ireland to their undergraduate years at Trinity College, between 2011 and 2015, out “austerity years”. Rooney attributes her bracingly dispassionate writing style to having spent “too much time” on the internet, steeped in the irony-laden “you-can’t-laugh-at-me-because-I’m-already-laughing” tone favoured by millennial tweeters and emailers everywhere. 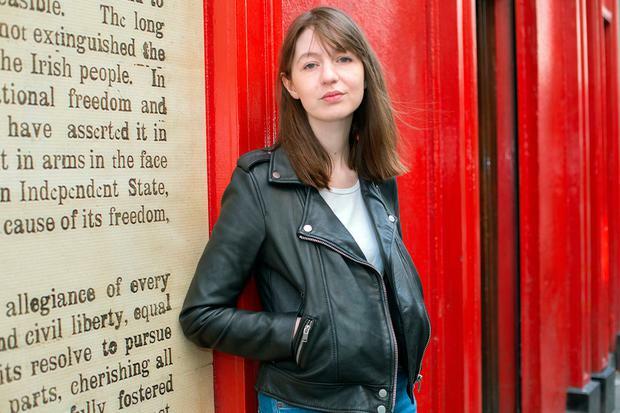 Around this time, she was contacted by a literary agent, Tracy Bohan at the Wylie agency in London, who had been impressed by an acerbic essay Rooney had written for the Spring 2015 issue of The Dublin Review, telling the true story of how, “motivated by a desperation to be liked”, she had joined Trinity College’s student debating society and gone on to become “the number one competitive debater on the continent of Europe”. (Rooney has subsequently drawn a veil across her whole debating period; in the new book, Gareth, Marianne’s privileged sometime boyfriend, is identified pointedly as a member of a debating society that invites a neo-Nazi to give a speech). The following year, Conversations with Friends sold in a seven-way auction to Faber and Faber as part of a two-book deal lucrative enough to enable Rooney to write full-time. When the novel was published in May 2017, it was greeted with critical approval and commercial success; Rooney was hailed as the voice of her generation. In July, it was announced that Rooney’s follow-up — the Marianne and Connell novel, now called Normal People — had been longlisted for the Man Booker before it had even been published, making its now 27-year-old author the joint youngest contender for this year’s prize. When we meet, in early August, the Booker endorsement has helped quell Rooney’s nerves about the reception of the new novel — “Now I can say it’s been received well, even if only by literally five people on the Booker panel!” — but it hasn’t dispelled them altogether. She needn’t have worried. In the weeks following our meeting, a succession of broadly ecstatic reviews appear — along with the news that a television adaptation for BBC Three, a collaboration between Rooney and the Oscar-nominated director of Room, Lenny Abrahamson, is in the pipeline. Whatever their other similarities, Rooney’s novels are remarkable for their high-definition depiction of their characters’ psychology. But where the earlier book maps only six months in the lives of its young cast — towards the end of which our narrator, Frances, concludes “you live through certain things before you understand them” — the more capacious time frame of Normal People allows us to witness the evolution of its initially teenage twosome as they help (and hinder) one another in their struggle to locate themselves in the world. A few pages later the author catches Connell seeking ways to avoid having to reconcile his private desires with his public persona and duck “the ultimate question of what to do with himself or what kind of person he is”. Although Rooney is now firmly established on the literary map and living what she identifies as a satisfyingly “normal” domestic life in Dublin with her boyfriend, a maths teacher — “he’s not really interested in books, and I think that is probably good for me” — she is not yet convinced that she has answered that “ultimate question” for herself. In large part, the problem is political. In Normal People, Connell attends a book reading and feels sickened by the way literature is “fetishised for its ability to take educated people on false emotional journeys, so that they might afterwards feel superior to the uneducated people whose emotional journeys they like to read about”. While she points out that “it’s important to bear in mind that he is suffering from very severe clinical depression at that point in the story”, Rooney, a socialist, sympathises with his viewpoint. “To feel that literature has any politically redemptive power at all just seems increasingly naive,” she says. But the course turned out to be off-puttingly “dry and technical — it was quite a lot of reading papers about the double-balloting system in France,” so she dropped out after two months and transferred to American literature. It still seems to rankle as a rare defeat. Could she not take the view, I ask, that by writing books for the pleasure and enrichment of those who like to read, she is fulfilling an important role of a different kind? “Is it though?” she says, sitting forward in her seat, the reserve with which she began the interview now burned off by the heat of her beliefs. “Because, the thing about books is that anyone can read them. Despite her earlier threat of a Salinger-like retreat, might it turn out to be her third novel in as many years?